Caesarea Philippi was in the far north of Israel. 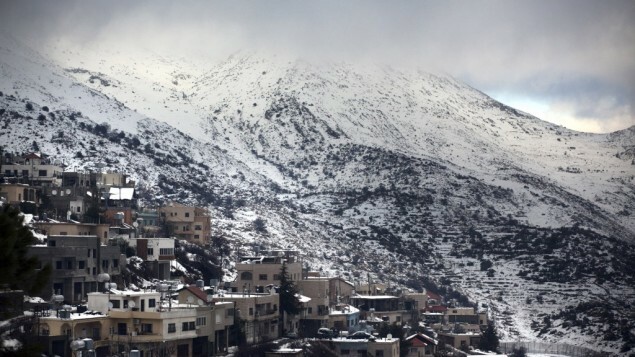 The city was located at the base of Mount Hermon. Hermon is 9200 feet in elevation. In Colorado, they are proud of their Fourteeners, mountains with an elevation above 14,000 feet. But the base of the Fourteeners can be anywhere from 8000 to 10,000 feet. Mt. Hermon is near the sea and is visible from the Dead Sea one hundred miles to the South at 1300 feet below sea level. So, though I haven’t been there, I assume the view of Mt. Hermon would be just as impressive as Pike’s Peak. Any city named Caesarea was built in honor of one of the Caesars. There is another Caesarea in Palestine, on the coast. The Caesarea below Mt. Hermon was built by Herod’s son Philip. Philip built a temple to Augustus Caesar there. There were other temples and shrines there too. Caesarea was a pagan city, barely part of Israel, at its northern boundary. The ground is rocky, and there is a cave or grotto that had long been considered by the local inhabitants to be the birthplace of the Greek god Pan. There is an English word that comes from this god’s name–pan-ic. One of his special abilities was believed to be spreading terror or panic among army troops. The Greeks prayed for his assistance against their enemies. They believed Pan could send mysterious noises among the ranks and make them think they were being bombarded by supernatural and human forces. Pan-icked soldiers would drop their weapons and run or even turn on each other. The human face of the god was ugly and frightening. He had horns, and his image later became a model for medieval paintings of the devil. His form was barely human on the top half, but below the waist he was a billy goat, and he was lusty and aggressive. Before Pan, the ancient nemesis of Israel, Baal, was worshipped in the grotto. The historian Josephus described the cave. Naturally, it was dark and there was a sheer drop off into a bottomless pit. As far as anyone could tell anyway, it was bottomless–except that far down there was water, and the water was deeper than anyone had ever been able to measure. The water filtered down through Mount Hermon from melting snow, and sometimes it surged all the way up and spewed out of the mouth of the cave. Because of its dangerous and mysterious nature, and because of its association with pagan gods, some ancient people considered this cave to be the gate (or one of the gates) of the Underworld (also known as Sheol, Hades, or Hell). Jesus took his disciples, and asked them a question as they stood on the bare rock near the cave of Pan. Who do people say that I am? Evidently the belief that one of the great prophets would return was strong at that time. After all, the Lord had said in Malachi, “behold I will send you Elijah the prophet before the coming of the great and dreadful day of the Lord.” To this day, when Passover is observed an empty chair is left for Elijah. At the end of the meal a young child is sent to open the door and look for Elijah. Elijah had challenged the idolatry in his day, and many people evidently thought Jesus fit that role well. Of course, before Jesus many thought John the Baptist fulfilled the return of Elijah prophesy. Remember Herod’s son Philip? His brother, Herod Antipas, had stolen Philip’s wife and John the Baptist rebuked him for it. That angered the queen, and she demanded John’s head on a silver platter. Jesus was related to John and began his own ministry before John’s ended, but not everyone was aware of those details. Jesus became well known after the death of John. Many people wondered if Jesus was John come back. Others saw him as the Baptist’s successor. Maybe Jesus was the Elijah who was to come. Other people said he was Jeremiah or one of the other prophets. I wonder why Jeremiah? Was it because he predicted the New Covenant? Or was it because of his sympathy and tears for his own people? Jesus spoke Aramaic. About a dozen Aramaic words are preserved in the New Testament. Twenty years ago when I was studying the languages of the Bible and the world where biblical history happened, I heard of a few villages in Iraq and Syria where Aramaic was still spoken. The people in those villages were Christians who were convinced they spoke the language of Jesus exactly as he spoke it 2000 years ago. I remember thinking it would be a great opportunity to go and study with those people and learn to speak their language as they spoke it. I don’t know for sure what has happened to those people but I am afraid the opportunity to go and learn from them is gone forever. The Aramaic word Kepha means ‘Rock.’ (In English it is spelled ‘Cephas’) The ground around the grotto of pan was solid rock. The rock rose up behind the cave toward Mount Hermon. Maybe Jesus had a sense of humor–or maybe he saw a potential in his disciple Simon that no one else could see. Jesus gave Simon a new name: Kephâ, Cephas, the ROCK. One thing about Cephas. When he didn’t know what to do, he would do something. When he didn’t know what to say, he would say something. So when Jesus asked, “But who do you say I am?” Simon-Cephas spoke up. By the way, when Greek speaking people started to follow Jesus, the name Cephas got translated for them into the Greek word for a rock, Petros, or Peter. Paul’s letters were written before the Gospels were written, and he called the big Fisherman, Cephas. But in the Gospels he is more often known as Peter. His full name is Simon bar Jonah (son of Jonah), aka Cephas/Peter/the Rock. Jesus is the one God the Father sent to bring us to him and to bring his love to earth. Jesus answered him, “blessed are you Simon bar Jonah, for Flesh and Blood has not revealed this to you but my Father who is in heaven. You are Cephas/Peter/the Rock, and on this Rock, I will build my church, and the gates of hell will not prevail against it. What did he mean “on this Rock?” Some say he means the faith he had just announced, “You are the Christ, the Son of the Living God.” This truth is the foundation of our faith. Years later Paul would write, “No other foundation can anyone lay but the one that is already laid, Jesus Christ.” The Truth of who Jesus is, is the foundation of our faith and of the church. Or did he mean the church would be built on Cephas/Peter, the Rock? “I will give to you the keys to the kingdom. Whatever you bind on earth will be bound in heaven. Whatever you set free on earth will be set free in heaven.” Fifty days after Jesus rose from the dead Peter used those keys. He said two things: “Whoever calls on the name of the Lord will be saved.” And he said, “God has made him both Lord and Christ (the Anointed redeemer), this Jesus whom you crucified.” When they said what shall we do, he answered, “Repent and be baptized, every one of you for the forgiveness of your sins, and you shall receive the gift of the Holy Spirit” In other words, when anyone prays to Jesus Christ, turns away from their sins and turns to him, and identifies with him by receiving the cleansing sacrament of baptism–Christ comes into their life, the Spirit of God enters their heart and soul and gives them a desire to do his will. He had the keys. Or when Jesus said, “on this ROCK” maybe he was being very literal. Did he mean, “on this Rock-hard ground, right here in front of the gate of hell–I’m going to build my church–and the gates of hell will not be able to withstand my attack. I am so glad Jesus didn’t call me to build his church. When I look out and see all the potential in this church and this community, and when I think of the responsibility to build the church–I can’t do it. But then I remember, he didn’t ask me to build his church. He asked me to follow him. He asks us all to build each other up in the faith. He asks us to bear witness to what we have seen and heard, what we have experienced. I am so glad Jesus didn’t call me to convince anyone of the reality of God or the truth of who he is. Those are two things we should all be glad of. We don’t have to build his church. We don’t have to convince anyone. We just follow him. We are disciples, followers and learners. We are also witnesses. Not eyewitnesses like Mary and Martha and Peter and John. They saw the empty tomb, they saw the risen Lord. We are faith witnesses, witnesses of what God has done in our lives through faith. I have read a lot on theology, philosophy, history. I enjoy discussing it. I know there are reasons for my faith. And if you want to talk about it over a cup of coffee, I am glad to do that. Look me up. But I can’t really argue or persuade anyone into believing in God or following Jesus. The reason I believe in God is because God is capable of making himself known. God loves everyone; he wants everyone to know him. But there is a timing that is known to God. When the time is right, he will call individuals to come to him by faith. Two things God used to convince me: One was seeing the presence of God in the lives of other people. I saw love, joy, peace . . . the fruit, the evidence of the Holy Spirit–which means the presence of God in someone’s life. The other thing God used was the Gospels. Matthew, Mark, Luke, and John–or the person of Jesus in those books revealing the presence of God in the world. The reason I believe in God is because of Jesus. The more I read his story the more convinced I became. It was not an idea. It was a way of life. As followers of Jesus, some bystanders will see him at work in our lives when we don’t even realize it. Otherwise, we can say “come and see.” The reason you should invite people to church is because they will see the love of Christ at work in his people. They will see that this is a loving family. And they will hear the gospel. Who do you say that he is? If you’ve never thought about that, maybe you should decide to start thinking about it. Read the story. This month, we are all trying to read the Gospel according to Matthew, the first book in the New Testament. Maybe you have thought about it and you know the answer. Maybe God has spoken directly to your heart. If you can say, Jesus is the Christ, the Son of the living God, then maybe it is time to ask him to come into your life. Maybe it is time to stand up and declare it.